Essential oils are very fragrant and that is why they are used widely in the perfume industry , some essential oils have very pleasant smells that make them perfect for using as a perfume instead of the chemical perfumes that may contain harmful ingredients like phthalates that may interfere the production of your hormones , essential oils also have healing properties , so don’t you rather using an essential oil as a perfume instead of the harmful synthetic fragrances? 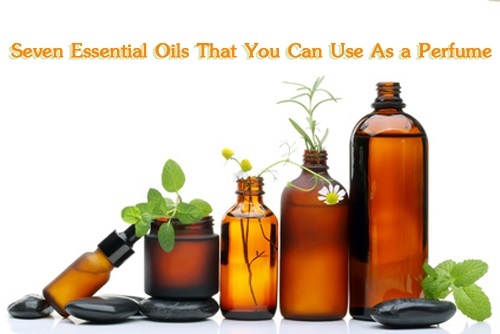 Below we will present to you a list of Seven Essential Oils That Can Be Used As Perfumes and the also have many health benefits . 7- Jasmine Essential Oil . Jasmine essential oil is one of the best essential oils that can be used as a perfume , it could be a bit costly , but it will be great for a special occasion , jasmine essential oil will help you reduce your anxiety and stress so it is great to boost your mood when you are not feeling so happy . 6- Rose Essential Oil . Rose essential oil is another ideal essential oil that can be used as a wonderful perfume to make you smell sweet and fresh , it could be a bit strong though , so you need to be careful with the amount you use , one drop of it is enough to make you smelling fresh throughout the day . 5- Patchouli Essential Oil . Patchouli essential oil has a soothing earthy fragrance that smells so sweet and calming , many people often associate it with the hippies of the 1960’s , the smell of patchouli essential oils can work for both genders perfectly . 4- Ylang Ylang Essential Oil . Ylang Ylang essential oil is extracted from the Ylang Ylang flower that has a floral calming smell , its delightful smell will make you feel more harmonious and calm . 3- Vetiver Essential Oil . Vetiver essential oil has a woody and earthy smell that will be suitable for you if you want a soft calm smell , it is made of the vetiver roots and it can help you if you are suffering from insomnia and anxiety . 2- Orange Essential Oil . Orange essential oil has a refreshing citrus smell that can boost your mood whenever you wear it , but be careful not to wear it directly on your skin because it could be a bit irritating specially for sensitive skins . 1- Vanilla Essential Oil . Vanilla essential oil is widely used in many perfumes and body sprays , if you like the sweet fragrances of vanilla or your usual perfume smells of vanilla then vanilla essential oil will be ideal for you .